This wine label from Knudsen Erath Winery describes its Chateau Webfooter 1978 Yamhill County Red Table Wine. 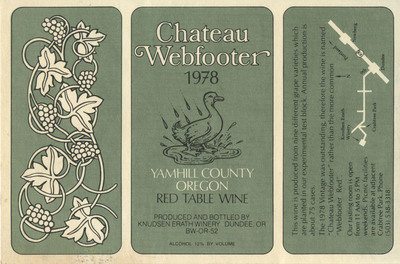 Knudsen Erath Winery, "Chateau Webfooter 1978 Yamhill County Red Table Wine Label" (1978). Erath Winery Photos. Image. Submission 100.